Many people underestimate the difficulty of setting goals. There is something about the goal setting process that can cause even the brightest person to freeze in their tracks. It’s interesting that many companies spend so much time and energy setting the strategy at the executive level even bringing in consultants and going away for multiple days offsite but expect everyone else in the company to inherently know how to set goals and to do it in their spare time. Here’a process that will take the headache out of goal setting for everyone and increase the odds of successfully achieving your objectives. Meet MAT. MAT is smarter than SMART goals because it streamlines the goal into the essential requirements of a metric, an action, and a timeframe. Anytime you can streamline a process you automatically become smarter. SMART stands for specific, measurable, achievable, relevant, and time-based. If your goal meets the three criteria of the MAT process it will naturally fit those criteria. Metric – every goal needs to have a number or a percent attached to it. If you can’t measure it, it isn’t a goal. Always start by determining the current metric. Too many people go about setting unnecessary goals because they don’t know what the current result is. Why spend time trying to improve something that’s already working? There is some truth to the old saying ‘if it ain’t broke don’t fix it’. Focus on impoving things that really need it first. Don’t set a goal if there is nothing to improve. Action – what specific action are you taking? Earn revenue, open locations, hire staff, etc. Time – when will you complete it? This would naturally be the end of the year for the one year goal – simple, I know. If you realize that the goal is too big to complete in that time frame, refine the goal until it is manageable. The MAT process drills goals down to their finest point leaving no room for ambiguity. Each section is either complete or it isn’t. Following this very simple process will help you determine the best goals. 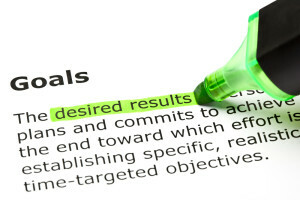 Goals should be crisp, clear, and concise. Aim for stating the goal in one sentence. It will be very tempting to overcomplicate the goal setting process. Resist the urge to get into details about how these goals will be accomplished. When you’re writing a goal you don’t need to worry about how it will get done, you only have to decide what will be done. You may look at those short sentences and think ‘that can’t be it, there must be more, it’s not enough!’. You may want to sneak in unnecessary words to beef them up, to make them meatier. Stop. They are just fine the way they are. Keep it simple, keep it smart.